DIARY OF A PUBLIC SCHOOL TEACHER! : Popular Posts of 2013! Honestly, I have reached that age where I can't even remember what happened in 2013. Life has become a blur. The years are whizzing by! 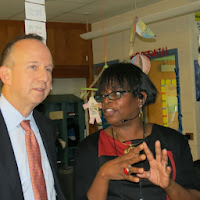 One of the highlights of 2013 was having the governor of Delaware visit our class to start off American Education Week. We had a Mystery Skype and he LOVED it! We need to show our politicians what we can do besides test!! "Now, here's what I need Gov.Markell!" Another highlight was meeting our Spain pen pals via Skype. The kids were delighted to meet each other "in person!" With the help of Blogger's page views, I can pinpoint my most viewed blogs of 2013. I share those with you. And if you didn't get a chance to read them when they were written, now is your chance! Enjoy and Happy New Year to the best audience ever! May 2014 bring you what you need, and, what you want! Bill Gates: Experienced Educator:$50 Million Dollars Doesn't Lie!